Elizabeth, these are delicious! We made these in an 8 in.² as per the recipe. We couldn’t help but notice that in the photos you used a 13 x 9 x 2. Did you double the recipe or is that how you make yours? Our finish product looked a lot thicker than your finished product. So happy you liked them! So actually, the photos are a bit deceiving- I used a 11 cup pyrex glass dish to cook these- the dimensions are about 10″ x 8″. So I should probably change the recipe instructions to be a 9×9 pan instead of 8×8! I was looking for a standard size since not everyone has one of the pyrex dishes. Luckily, this recipe is good whether it’s thick or thin- it cooks pretty much the same no matter what pan I put it in. Thanks for the heads up- I’m going to change the recipe instructions right now! I have just made a batch of these flapjacks. It was pretty hard to wait until they had cooled before eating them, the smell while cooking was mouthwatering! I added chopped cashew nuts and I’m very pleased to say they taste as good as they smell ???? Thanks for posting this recipe, I will definitely be baking these again! I am in the process of baking these now they seemed very good without all the sugar i tried some of the mixture before i baked it, yeah it was awsome, I added a mixture of nuts and flax seed. I’m so happy you like them!! I have a batch in my fridge right now- I make these constantly. These were very easy and delicious. Thanks for coming up with this recipe! I was looking for something else to do with ripe bananas that isn’t banana bread. 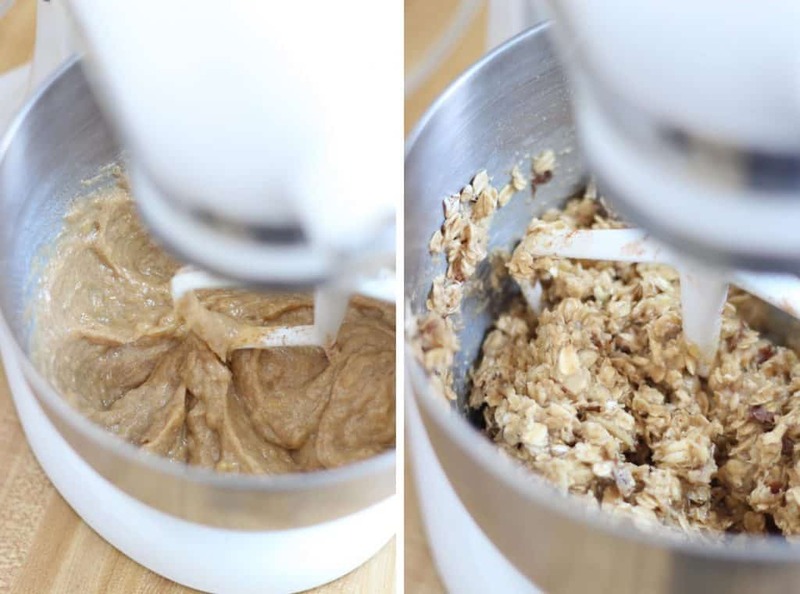 Even though I’m not a fan of most store-bought energy bars because of their texture, I was willing to give these a try since the ingredients were similar to a no-bake granola bar recipe that I like quite a lot. A few things I thought I’d share with others are to definitely use parchment paper & to leave the mix to cool in the pan/dish – once it’s cooled down it’s easier to lift out. Also, they taste better after being refrigerated. I ate the crumbs after cutting it up & found it a bit bland but they just need time for the flavours & texture to come together – it made me wonder if those who didn’t like the bar ate them too soon? I really love the salty-sweet combo & will try adding 1/4 tsp of salt next time. Also intrigued by another suggestion to add dried mint so will give that a try too (but not with the extra salt) & maybe some chocolate chips. Looking forward to experimenting with the next batch! These are amazing! I used square silicon bakers to make them even easier to manage serving sizes! Thank you Elizabeth! Thanks Emily! LOVE that idea! Thank you! 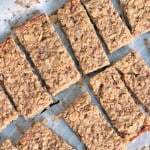 I finally have an oatmeal bar recipe! Have just made this for a friend! Might have to make for me too! I used walnuts, sunflower seeds and chia seeds for extra goodness! Awesome! I just made a batch the other day and have them in my fridge right now- they are SO great to have on hand :-) Love that you added some seeds to it- I’ll try that next time! My daughter LOVED these before I even put them in the oven! lol. I used Raw honey and Natural Peanut butter and substituted the sugary peanut butter for some chocolate chips. I used crushed up cashews and I admit, I HATE nuts in my baking, but this was SCRUMBDILIUMPTIOUS! I’m so glad you and your daughter liked this! LOVE the idea of using cashews. I’m an insulin-dependent diabetic so I’m always searching for things that are reasonable in the amounts of sugar and this is certainly that way. I’m excited about making them in the near future. ever try putting just max 1/4 teaspoon of dried peppermint leaf to this recipe? sounds nuts (no pun intended), yes it does but having a few before staring the days work takes the edge of the hunger. great recipe but seriously think about making 2 batches the first to eat the second to freeze and keep for the next time there is too much to do in a day. how many grams does the carbohydrates,protiens and fats contain in this receipe? I use a super handy online calculator to figure out calories and nutrition facts that might be helpful for you: https://www.caloriecount.com/cc/recipe_analysis.php Looks like there are 273 calories per bar with 15.8 grams of fat (24% DV), 27.9 grams of carbs (9% DV), and 9.2 grams of protein. Hope that helps! What kind of oatmeal should I use? I usually have rolled oats on hand, but currently only have quick 1 minute oats. Have these in the oven now and almost done(I think). Should the top of the whole mixture be kind of solid like the edges, or should it still be soft when taking out of the oven??? It can still be a little soft but not too soft- like banana bread kind of! It will harden a bit as it cools. Hope that helps! I’m wondering what size pan you used for these bars. Thank you. Your recipe sounds great. Will have to try it . I use paste of dates in my recipe and a teaspoon of honey so it cuts down on sugar and adds fiber and natural sugar in the bars that I make. Great suggestion- I love using dates for natural sweetness. Hope you like it! Won’t work if you can’t have sugar, syrup, or honey. What about using Stevia? And by the way you can make a multitude of cookies with the bananas and oatmeal by adding Stevia, nuts, a little salt and various extracts. I have made flavors from banana walnut to coconut almond dusted with cocoa powder to mint chocolate to orange pecan. Just be creative!! They freeze well so you don’t eat them all in one sitting. Forgot to mention with the cookies that recipe I started with called for scooping and dropping on baking sheet. I go extra step to flatten with fork much like you would with peanut butter cookies. They will not rise or get any larger but they are more “cookie” like. Congrats on your new baby! I made these today, and they were so good! The only change I made was I used 1 cup of powdered peanut butter reconstituted with 3/4 cup almond milk to shave a few calories. I used pecans. Made them into 24 breakfast “cookies” at about 100 calories each. Baked them on parchment for 13 minutes. Thank you for the great recipe! Thanks so much and glad you liked them! Is the parchment paper absolutely necessary or can I just grease pan or use foil? I think you can just grease the pan and it should be fine. I don’t usually use foil for things like this so I’m not sure if it would work. I mostly just use parchment paper so I don’t have to wash the baking dish :-) Hope you like the recipe! This is not a vegan recipe if it has honey in it. That tag should be removed. Thanks for putting this on my radar, Colleen! Not being a vegan myself, I always forget that honey is so controversial. From my understanding, some vegans eat it, and some do not (even though by definition it is technically not vegan since it comes from animals). I edited the recipe to include a note for vegan-friendly substitutions. Thanks again! Getting tired of making banana bread with leftover ‘naners SOoooo I thought I’d try these out! I’d prefer them chewy but not sure how that would affect taste, solidity, shelf life, etc. Hi! So sorry for the delayed response- I have a good excuse… I just had a baby a week and a half ago :-) I think it would be hard to overcook them because the bananas make them pretty moist. When I make them, they have a very dense cake-like consistency. Try cutting the time a bit since your oven runs hot and if it looks like they are browning really fast, you can cover them with foil. Hope that helps! I wonder if agave nectar would work as a good honey substitute to make it truly vegan. What size pan did you use to bake these bars? Hm I’m not sure of the exact dimensions! But it was on the smaller side. An 8×8 square pan or something like it would work perfectly. These are great! I needed a new pre-workout snack and these are perfect. I like that they are not too sweet (I used just a bit of honey and may cut it out entirely next time)–adding some dried cranberries and golden raisins was just enough. Thanks for sharing! Yay, so glad you liked them! Love the additions you made. These things are AHmazing!! I have tinkered with them a few times and this is what I’ve come up with. I’ve discovered you really can’t go wrong. Thanks Elizabeth!!! So glad you liked them, and thanks so much for all these awesome suggestions! I LOVE the idea of adding berries to them! I think ground or whole flax seeds would work fine! Just not too much if you use ground, since it might make the bars a bit too crumbly (like adding too much flour to a recipe). I used whole seeds. Flax, chia and a little hemp. Plus I use crunchy peanut butter, I like the nuttiness of it all. These sound super delicious. Thanks for sharing this recipe with us. It’s not exactly the best tasting thing ever, in my opinion. I added some chocolate to make it somewhat enjoyable. It definitely fills you up and is a little bit healthier than eating a doughnut for breakfast. I won’t be making this again, though… I’m sure many people will enjoy it, it’s just not for me. I’m going to try these with some Vegan Vanilla Protein Powder (the brand is Kaizen)! I have only a few things in my pantry and I didn’t want to buy a whole pack of flour so these will be perfect for a broke college dude who doesn’t like the campus cafeteria haha. Thanks! Hope you like them, and hope you enjoy your school year! Jill- I’m sorry these did not come out good for you! They definitely have more of an “energy bar” taste than a “granola bar” taste, and I have to admit: I only like these as a snack sometimes. I have to be in the mood for them, just like with power bars, especially since they aren’t very sweet. But for me, they are perfect when I want a boost of energy from food and don’t want something too sweet. 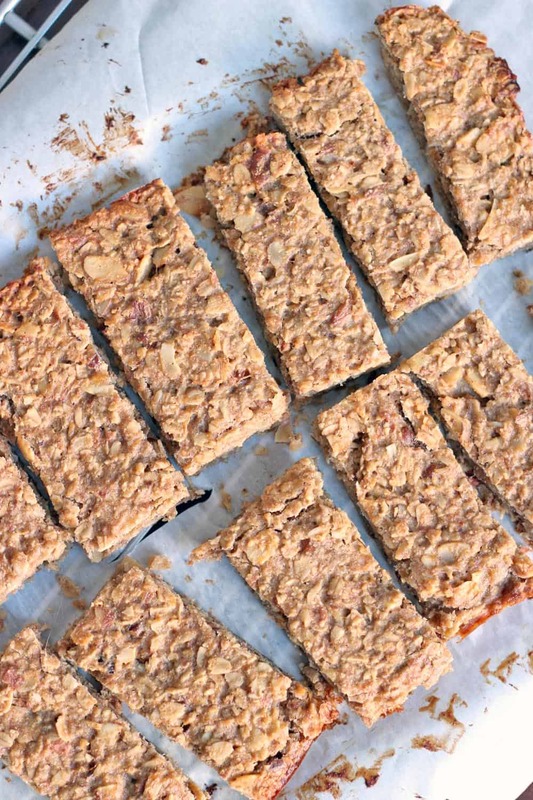 Are you talking about these granola bars from minimalist baker? http://minimalistbaker.com/healthy-5-ingredient-granola-bars/ I HAVE to try those- thanks for the suggestion! They definitely look sweeter than mine- with the addition of dates as both a sweetener and a binder. They look like they have more crunch as well, since the oats aren’t baked and they use almonds in them. As for the texture of the energy bars- it’s possible your oven runs hot and they became overcooked (which would cause them to fall apart easily). Anyway… better luck next time! Could I get the macronutrients for the bar??? Thanks that helped a ton! Any chance you would know the count of the simple carbs (sugar) by itself apart from the complex carb? I just made these today after looking over your recipes. The chicken was so delicious that I decided to try these. Another wonderful recipe !!! I was short a half cup of peanut butter so I added Nutella. Super !! Also threw in some mini chocolate chips. This is a wonderful and fun to make healthy snack or mini meal. Can’t wait to see what you post next. Love your recipes !!!!! This is the perfect recipe I’ve been looking for! It came out delicious. I also added some frozen berries and dates. Thank you!! Going to make these tomorrow to take to my daughter at college. What size baking dish? 8×8 or 9×13? What a nice gesture for your daughter! I’m sure she will appreciate them, and I hope she likes them :-) An 8×8 dish is best. Thank you for your quick response! Trying to eat healthy snacks at school can be a challenge so after receiving her request for “something healthy”, I’m going to attempt your 5 Ingredient PB & banana energy bars and also the Banana Blueberry Muffins. Happy to have found your recipes! Thanks! I didn’t have honey so I added an egg to mixture. I used walnuts and then added 1/2 cup of chocolate chips. I guess it is not the same recipe now but it was good. Not to sweet at all, so the chocolate chips were very welcome. Thanks for sharing your substitutions! The honey does not really bind it together- the banana does that. The honey is just a sweetener. So while the egg added some protein (which is great!) it wasn’t necessary :-) And good job adding the chocolate chips- I’ll have to try that next time! Just made these! I added two bananas and dried cranberries. THEY’RE DELICIOUS! The perfect snack before my adult gymnastics classes! Awesome idea about the cranberries! I’ll have to try that next time. Thanks, and so glad you liked them! can I bake without the baking sheet if I don’t have ? Will it stick? You mean without the parchment paper? I’ve never tried, but I think it would be fine as long as you grease it with butter or oil before cooking! oh ya that’s what I meant. Alright then I’ll be using coconut oil. Love the recipe!! Thanks for sharing!! Just finished making them.. Perfect !!? Hi, these are delicious!!! Made them per recipe with almonds, any idea how many calories/sugar per bar?! Success! Just made them and they’re delicious. I only has 2 bananas so i added half a cup apple sauce. I also used pumpkin seed butter instead of peanut butter. Great recipe! Woo hoo! So glad you liked them :-) Great idea to use pumpkin seed butter. I’ve never had that before! Love trying new foods- can’t wait to pick some up. Thanks for the comment! These sound awesome!! Do you have an ideas for a sub for the banana? My kids don’t love bananas. Thanks!! Awesome-will try it thank you!!! I think maple syrup would work great! You can also just use plain old sugar, or brown sugar. These look so good! 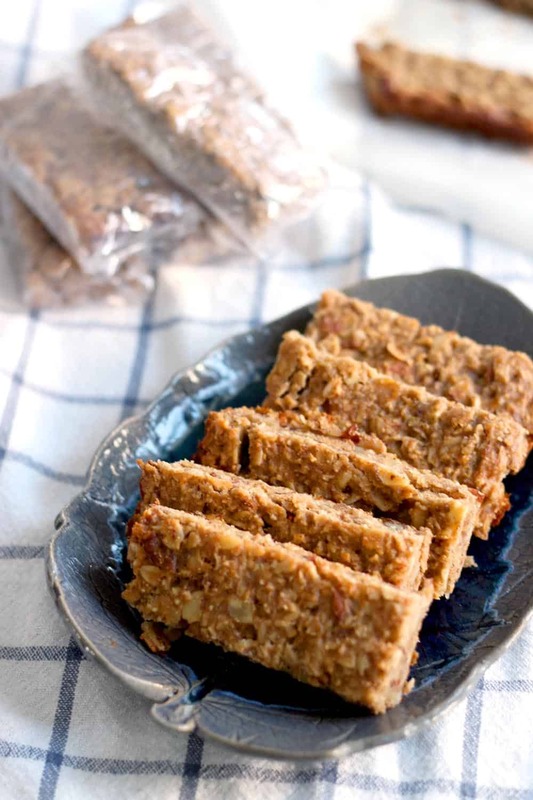 Sometimes energy bar recipes have way too much ‘stuff’ in them (nuts, coconut, things I don’t like :P) but this recipe has the perfect mix– peanut butter and banana? YUM! 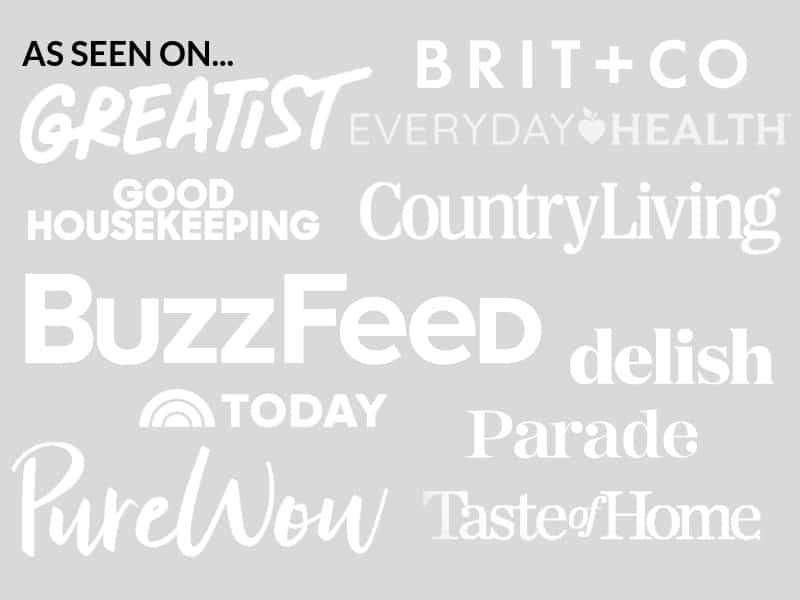 Thanks for sharing– I added you to my Feedly, all your recipes look so good and I am so glad I found your blog through the BlogHer group! So much yes! 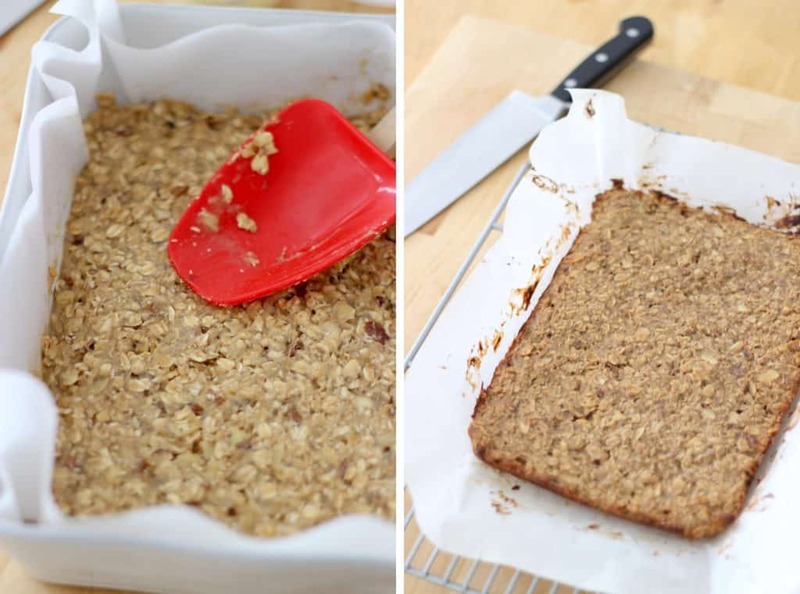 I am totally into energy bars right now and this would make the perfect post-workout snack! Love these! They will be my next on the go breakfast treats!!! 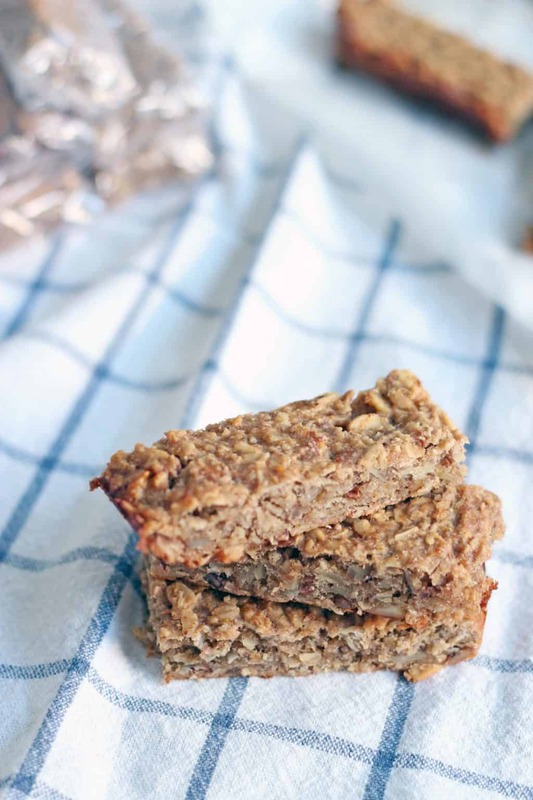 I love the combo of peanut butter and banana so these energy bars look delicious! I love having snacks like this on hand for my kids who seem to eat constantly! Thanks for this new idea! OMG! I am making these this weekend. These look like a perfect snack for me to bring to work. I’ve been making an oatmeal bar that’s more complicated than these. I like that there aren’t a ton of ingredients and these aren’t loaded with sugar. Will have to try!